Art Journals would be fun to look at in 30 years. An excellent artist gift especially for those teens starting to draw and expressing with art. Is your young artist or fashion sketcher spending hours on the blank page? Filling it with youthful expression? This would be a gift for them. The Global Art Materials art journal, officially under trade mark, hand book journal co., can be a good choice for an artist gift. A visual journal is the artist's everyday diary. I drove more than 23 miles looking for this item at the closest Blick art store, and learned it is not stocked in the store. Affordable art journals are available on the Internet. Sometimes it is just easier to order online. Look at these photos and decide what is there not to like? Luscious colors, cloth hand bound cover and heavy weight buff hued paper. 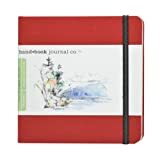 Compare the prices of other artist journals online. Here is a sketch book started some years ago. Quality of paper is poor. This is a blank journal found for less than $5.00 dollars. It is more suitable for writing. For the person who likes to draw. Texture, color and paper used makes all the difference for the budding artist. Notice the nicely rounded corners. When choosing a journal keep in mind what your artist likes to focus on. Watercolor books have thicker paper than the items marked Drawing. Take note from the video posted below how nicely the journal opens and allows for double page water coloring. If your young or beginning artist is using a blank book similar to the cheap one shown above, consider something better like a handbook journal. Offer the new artist something they will love to keep. There are many colors and sizes to choose from. Full details of the product follow. Plenty of blank books are offered at better prices, but for the lover of pencil stretching, buff paper is an artist's preference. Texture will make the difference when lead is applied to the paper surface. The bindings are made for flat page opening and a handy pocket allows for tucking in important notes. Each book has a closure band and orange ribbon page marker. Do you know a young person who likes to sketch? Leather journals are very prevalent. Cotton cloth may be the preference for the budding vegan or those that avoid things made from animal products. The journals are available directly from the company. The full compliment of sizes and colors are ready for your gifting needs at birthday time or the next holiday. 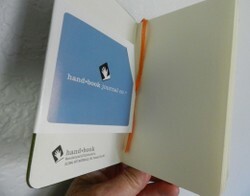 An Artist's Review of handbook journal co.
paperfacets, Thank you for the product line. The art journal sounds great, particularly with nature observations during outdoor activities and for school field trips. A journal seems like a great idea for a gift for a teenager, Sherry. All about Sharpie markers, a permanent type of marker that any artist can use in any designs from illustrations to tattoo art to other graphic design work. How to draw a cartoon cat step by step with step by step illustrative photo steps. Draw a cartoon cat and have fun drawing.